Our "What Are You Smoking" sign is a humorous take on juxtaposing the popular smoking pipes of the past with the popular smoking culture of the present. As this suave man with his slick backed hair smokes his pipe, he's asking you "What are you smoking?" Figuratively, of course. 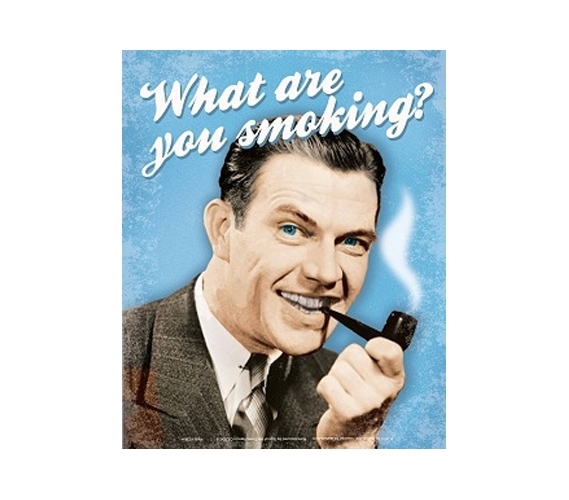 The perfect dorm wall decor for a college guy with a sense of humor, our "What Are You Smoking" Funny Tin Sign is sure to make your crack a smile whenever you look at it. It'll also resonate well with your friends and dorm hallmates who are sure to come in your dorm room and laugh when they see this funny tin sign adorning your dorm walls.